Starting research on emotions in paralyzing. Having a background in communication science and not in psychology probably makes it even worse. On one side, there is simply too much to know. On the other side, I am not in the mood to repeat all the things hundreds of authors already wrote in thousands of books again and again, but always slightly different. That is why I felt kind of stuck during the past weeks and I realized that I can only deal with the topic when I concentrate on those aspects or perspectives, which are relevant for my research. But what is relevant? What do I need to know about emotions to be able to deal with it? This is what the following blog post will be about. Emotions can be examined from so many different views of different scientific fields and contradictory theories. 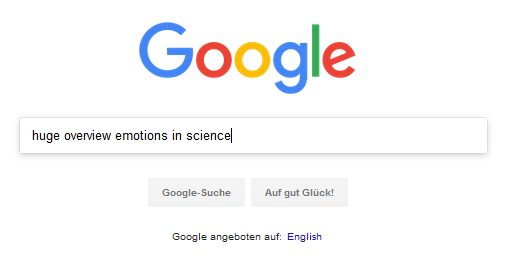 For the start, best would be a huge overview about emotions in science. Maybe in form of a nice visualisation. A bar diagram, or something with graphs. I asked Google. There was nothing like this. 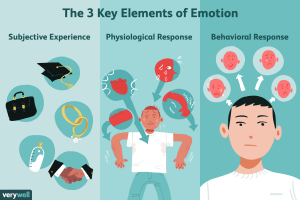 2 – emotional reactions (expressions, incentives for actions, physiological reactions, subjective feelings and typical thoughts, which are connected to emotions). The comment section as emotion-elicitig situation, the recipients as those, who emotionally react. Seems to be an easy assignment… doesn’t it? Right now I want to spend particular interest on one variable: Emotions represented in comments. For people who read this blog regularly (so for more or less nobody) this focus seems to be new. But in fact, these ideas are my fundamental ones. I uploaded a guest lecture I was having in Hamburg on the Digitale Medientage 2017. Following aspects more or less already involve the ideas of the article including some results of smaller projects. The assumption is: Commenters represent their emotions in comments using the communication conditions which are given to them, which is mainly text, sometimes emoticons or emojis, GIFs or others. Recipients read the comments and notice the occurrence of emotions or at least perceive something to be emotional, no matter if it is really emotionally meant or not. What a commenter was thinking or if he was somehow emotional is not my research interest. It is how people react on a message which they perceive to be emotional. Under what circumstances do people perceive a message to be emotional? how a reader interprets this as a particular emotional state. What kind of emotional states are distinguishable? If I now know what expressions of commenters lead to the perception of different emotional states by the readers, I have my dependent variable: the perceived emotion by the readers, which may trigger their emotions. To what emotional reactions do perceived emotions lead? Similar to the elaborations above, it is necessary to explain certain terms to get closer to the answer. In this case it is emotional reactions. This is my leading dependent variables. So what are emotional reactions? First thought: If there are emotional reactions, there will also be other forms of reactions, such as maybe cognitive ones. At this point I can not ignore the question of a definition of emotions or at least a discussion about how to differentiate the term from cognition. In this context another basic gap of knowledge appears: If there are different forms of reactions, there must be different triggers or processes as well: So when do emotional reactions appear in contrast to cognitive? What processes are behind our emotions? This leads to a third and final lack of knowledge: If emotional reactions were activated, what is to expect? Hate? Love? It’s the question about a differentiation. What are emotions and how do they differ from cognitions? Why and how do emotional reactions elicit? What kind of emotional reactions exist? how emotions can be expressed (focusing on CMC). What you see in parantheses are at least some starting points for theoretical research I already know about. In the end it is important to see what the emotional reactions tell us about the influence on people’s opinion-formatting processes? According to Lecheler, Bos, and Vliegenthart (2015), “emotions act as mediators of effects on policy opinions” (p. 813). Nevertheless writing about emotions triggering emotions, I am still interested in moderating or mediating factors. This is the “context”-part. It’s not only emotions influencing emotions. I cannot gain conclusive results if I ignore mediating factors, such as mentioned in the beginning: environmental cues, peoples’ personality, topic involvement or online experience. What is necessary here is to theoretically know about on what factors influence emotional reactions. This is not something I “need to know about emotions” as this blog entry tries to list. That’s why I make it short here. * As a third position techniques for self-regulation are listed. For the current purposes, this should be of low relevance. Kleinglinna, P. R., & Kleinglinna, A. M. (1981). A Categorized List of Emotion Definitions, with Suggestions für a Consensual Definition. Motivation and Emotion, 5(4), 345–379. Schemer, C. (2010). Wie Boulevardmedien Emotionen schüren. Der Einfluss der Mediennutzung auf Emotionen in politischen Kampagnen. In C. Schemer, C. Wünsch, & W. Wirth (Eds. ), Politische Kommunikation: Wahrnehmung, Verarbeitung, Wirkung (1st ed., pp. 133–152). Baden-Baden: Nomos Verlag. How do you like the article? Weiter Wissenschaftliche Ernsthaftigkeit: Wie war die DigiKomm-Jahrestagung?